Harvick started second and finished first. Scored 10 bonus points and a playoff point for winning the stage. Harvick led twice for 34 laps in this stage, including the first 21 laps and the final 13 laps. A caution on lap 22 allowed Harvick to bring his No. 4 Jimmy John’s Ford into the pits for four tires and fuel. Some drivers who elected to pit earlier during a caution on lap five, and others who took only two tires, restarted ahead of Harvick. After restarting fifth on lap eight, Harvick worked his way back into the lead on lap 108. The No. 4 Ford came to pit road at the conclusion of the stage for four tires and fuel. Started first and finished first. Earned 10 more bonus points and another playoff point for winning the stage. Pitted on lap 154 while the race was under caution. Grabbed four fresh tires and fuel. Restarted in second place behind Brad Keselowski on lap 159. Harvick doggedly pursued Keselowski, eventually retaking the lead on lap 200. The Jimmy John’s Ford led the final 41 laps in Stage 2. Even so, Harvick said he needed his car to turn better. Harvick brought the No. 4 Jimmy John’s Ford in at the end of the stage for four tires, fuel and a right-rear wedge adjustment. Started first and finished first. Led 29 laps before caution on lap 273 allowed Harvick to pit for four tires and fuel. Two cars stayed out during this caution (Ricky Stenhouse Jr., and Jamie McMurray), and two cars took two tires (Keselowski and Joey Logano). This put Harvick fifth for the restart on lap 281. After momentarily dropping to sixth, Harvick returned to the top-five with 100 laps to go after passing Keselowski. Harvick passed Martin Truex Jr., for fourth on lap 310, and then passed Logano for third on lap 312. Harvick got by Stenhouse on lap 315 to take second, and slotted in just behind teammate Clint Bowyer, who was leading. A brief rain shower on lap 316 halted the race, eventually leading to a red flag that lasted for 41 minutes. Before the race went back to green, Harvick pitted for four tires and fuel and a right-rear wedge adjustment. When the race restarted on lap 326, Bowyer and Harvick were first and second, respectively. Harvick passed Bowyer for the lead on lap 338 off turn three of the 1-mile, concrete oval. Once he was back in front, Harvick never looked back. He cruised to victory by 7.45 seconds over Bowyer. 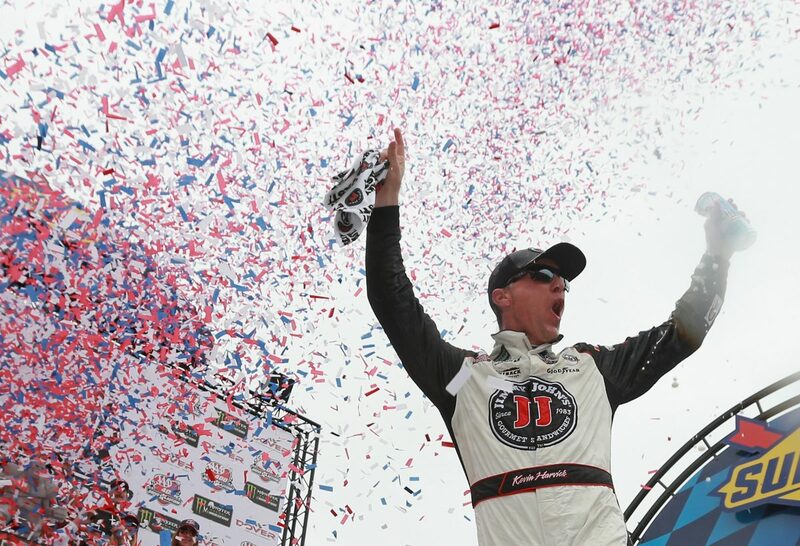 Harvick’s victory in the AAA 400 Drive for Autism marked the 48thoverall win for Stewart-Haas Racing (SHR). It was the organization’s 44thpoints-paying Monster Energy NASCAR Cup Series win and its third at Dover. Sunday’s win marks SHR’s fifth victory in the first 11 races of the 2018 season. This is the earliest in the season SHR has ever had five wins. This was SHR’s eighth Cup Series victory with Ford. The team won its first race with Ford when Kurt Busch captured the 2017 Daytona 500. Bowyer finished second in the AAA 400 Drive for Autism to secure the fourth 1-2 finish in SHR history. Its last 1-2 finish came on June 25, 2017 at Sonoma (Calif.) Raceway when Harvick beat Bowyer. This was Harvick’s 41stcareer NASCAR Cup Series win, giving him sole possession of 18thon the all-time Cup Series win list. This was Harvick’s 18thCup Series victory since joining SHR in 2014. This was Harvick’s series-leading fourth victory of the season, and his eighth top-five and ninth top-10 of 2018. Harvick’s four wins in 2018 is tied for his second most wins in a season, behind only 2014 when he won five races. This is the sixth time Harvick has scored at least four wins in a season. This is the first time Harvick has won four races in the first 11 races of a season. The last time a driver had four wins in the first 11 races of a season was Jimmie Johnson in 2007, who won 10 times that year. Harvick earned his second victory, sixth top-five and 16thtop-10 in 35 career Cup Series starts at Dover. Harvick led six times for a race-high 201 laps to increase his laps-led total at Dover to 1,156. Harvick has led the most laps in four of the last eight races at Dover, and has won two of them (October 2015 and May 2018). There were eight caution periods for a total of 48 laps. Only 13 of the 38 drivers in the AAA 400 Drive for Autism finished on the lead lap. “The first thing I’ve got to do is just thank everybody on my team – everybody at Stewart-Haas Racing, Roush Yates Engines, everybody from Ford for just continuing to put the effort that they put into these cars. Three cars in the top-five says a lot about where we are as a company, but everybody from Jimmy John’s and Busch and Ford, Fields, Haas Automation, Mobil 1, Morton Buildings, Textron Off-Road, Liftmaster and the fans, especially. It was great to see those fans stick around for the finish. It’s fun racing your teammate. That says a lot about our company and one of your good friends, as well. I just want to say hi to DeLana, Keelan, and Piper at home. The next event on the Monster Energy NASCAR Cup Series schedule is the KC Masterpiece 400 on Saturday, May 12 at Kansas Speedway in Kansas City. The race starts at 8 p.m. EDT with live coverage provided by FS1 beginning with a pre-race show at 7 p.m.